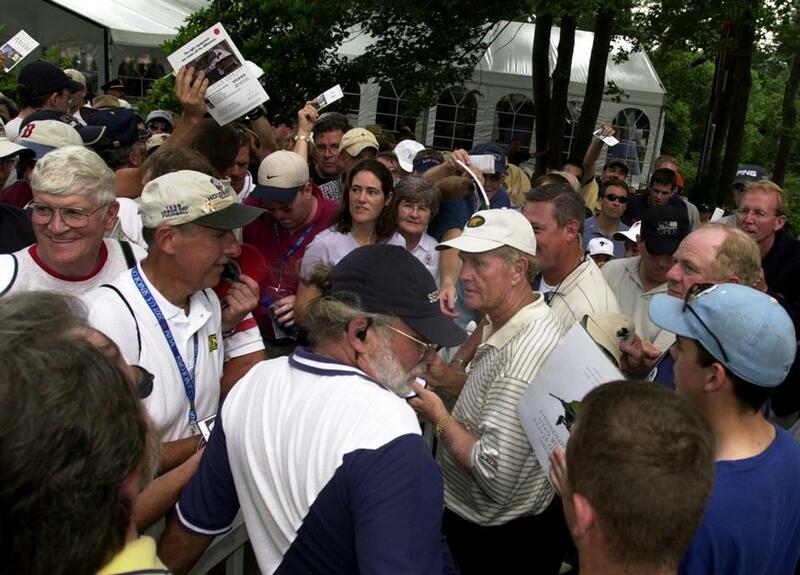 Jack Nicklaus is swamped by fans wanting autographs after completing the 2001 US Senior Open at Salem Country Club. As a boy growing up in Peabody, Bill Sheehan walked along Forest Street every day during the summer to his job at Salem Country Club. He’d caddy two loops, then park cars at night. After taking his work ethic to Yale and Boston University, he came home to practice law, and joined the club as a member. This week [beginning with a practice round Monday, June 26], Sheehan’s long association with Salem Country Club will pay off in another way when he’s honored as general chairman of the 2017 US Senior Open. It will be the sixth time the historic course has hosted a United States Golf Association championship. When Salem last hosted the Senior Open in 2001, Sheehan, now 64 and living in Rowley, served as caddy chairman. 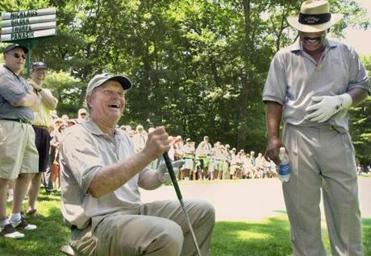 By all measures, that event was a roaring success, with a down-to-the-wire finish [Bruce Fleisher won by one stroke] and one last Massachusetts appearance together for golf legends Jack Nicklaus, Arnold Palmer, and Gary Player. The tournament drew record attendance and provided a reported $30 million boost to the local economy. Even the uncooperative weather – on Saturday, a major thunderstorm left 14 players with incomplete rounds – gave the grounds crew a chance to shine. They worked all night and had the course in top shape for play to resume before 7 a.m. Sunday. The return of the Senior Open gives North Shore golf fans another opportunity to see some of the preeminent names in the sport, including Tom Watson, Fred Couples, and Bernhard Langer, who is fresh off his record ninth senior major win. Bruins great Ray Bourque, who has been a member of the club for 25 years, will serve as honorary chairman. For fans, the compact layout of the challenging course, designed in 1925 on former farmland by the celebrated architect Donald Ross, means plenty of prospects for up-close-and-personal spectating. Dan Doherty of Danvers, volunteer chairman, fondly remembered his encounters with Nicklaus in 2001. After wrapping up on the 18th hole, “The Golden Bear” recognized Doherty from the practice rounds earlier in the week. He told him he was headed to sign some autographs, “and I want you to have your kids there.” Nicklaus told the kids their dad was a great guy, and Doherty has never let them forget it. This year, Doherty will be looking out for Fred Couples, whose drives off the tee can be a little on the wild side. “I wish I was able to rebound as well as he does,” Doherty said. Volunteers – about 2,000 of them this year – are asked to work at least four four-hour shifts over the course of the week. They pay $125 to $150 for logo shirts and headgear. In return, they get frontline access to the course. 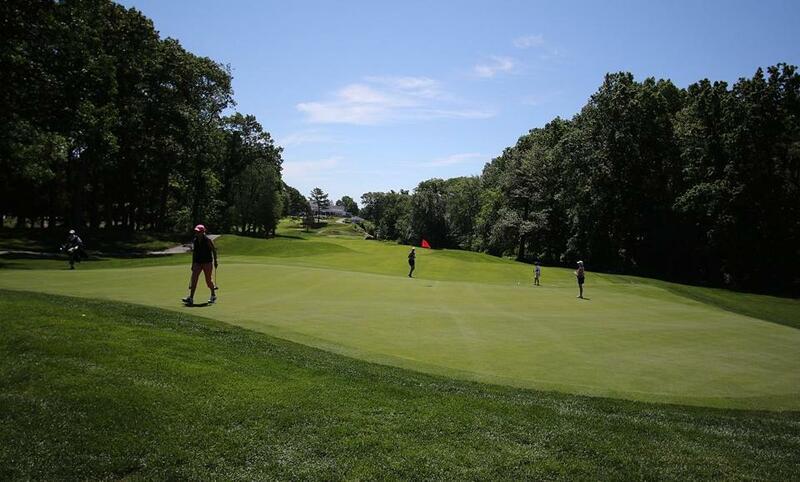 The club, tucked into a secluded area just off the Interstate 95/Route 128 interchange, will bustle with a lot more activity for the week of the tournament than in 2001, with more than 100 vendors setting up shop. “It’s basically a small city on the golf course,” said Sheehan. Bill Sheehan was caddy chairman the last time the US Senior Open came to the Salem Country Club. This time around, revenue projections for local businesses has ballooned to as much as $50 million. Matt Bickford, the pro shop manager at Sun ’N Air Golf Center in Danvers, said most of his employees are volunteering, and his customers have been asking for help getting tickets to the Senior Open for months. “I try to make some phone calls for them, but it’s not that easy. I guess when they came in 2001, we received 20 or so tickets. I think it’s a little harder to get those this time around,” Bickford said with a laugh. On a recent weekend, representatives of Alabama-based Bruno Event Team conducted a series of orientations for volunteers at Bishop Fenwick High School in Peabody. Paul Mayer of Billerica held his swag bag as he talked about putting on his “best face” for the tournament. A retired CFO, he’s volunteering for the transportation team. 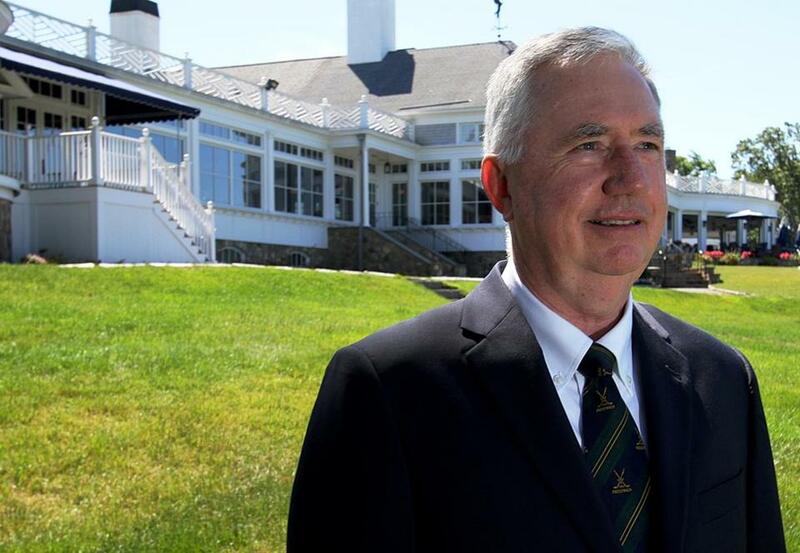 The return of the Senior Open is a “huge deal” for Salem Country Club and the area, he said. He’s been playing with the same foursome every weekend in southern Maine for nearly 20 years. For him, the chance to see some of the best in the world is well worth the commitment. Practice rounds will be held Monday, Tuesday, and Wednesday, with the four-round championship beginning Thursday, June 29. A gallery ticket for all rounds is $125; practice rounds are $25 each and championship rounds $50. Youth 17 and under are admitted free with an adult. For ticket information, go to www.2017ussenioropen.com/tickets or call 978-818-6006. The eighth hole at Salem Country Club is the longest and one of the most difficult.